Deeply embedded beneath centenarian live oaks dripping in moss is a child’s fairyland right here in New Orleans. In the heart of the city’s most impressive City Park is Storyland, an enchanted little playground that brings to life the most impressionable of childhood fairy tales. The inspiring sculptures that are of larger than life scale feature stories such as the Three Little Pigs, Little Red Riding Hood, Cinderella’s Pumpkin and Snow White and a few of her beloved dwarfs. The fire breathing dragon slide is amongst the children’s favorite of the mountable sculpture art. On any given afternoon, and particularly in early fall, the droopy trees keep cool this chamber of childhood fantasy. Along with the breeze, nostalgia envelops the guests with the fabled characters of our fantasies past and allows parents and children alike to channel childhood, enjoying the retreat into far away lands. Much like most all things in New Orleans, Storyland is no spring chicken. As history may have it, Storyland was created to help a local businessman in his slow growing amusement park. Learning of a California garden plush with greenery and oversized fairy-tale characters, he saw no reason why it wouldn’t work here in the fertile swamplands surrounding City Park. Thus, Children’s Storyland, as it was first called, open its doors in 1956. 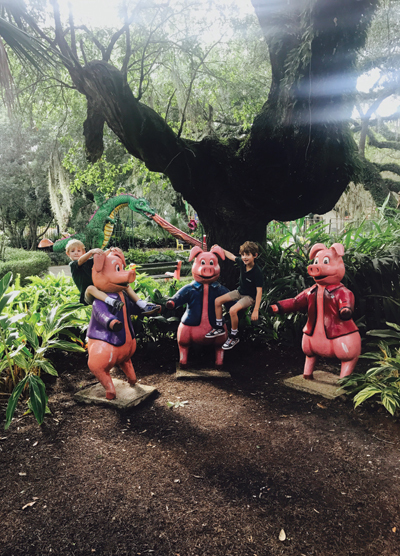 Since the purpose of the characters was to enrapture children’s minds and imaginations, they were built so sturdy that, even through hurricane Katrina, the park sustained minimal damage with only small nicks and cuts. The sculpture art is meant to be mounted, climbed on, poked-at and used, which is a different approach to art, and an expression of freedom for children who are often being taught to keep their hands to themselves. Initially Storyland began with 13 nursery rhyme themed attractions, adding more as they went, growing now to almost double in size. Some of the most notable scenes are Old King Cole’s castle that offers a stairway to its battlements; a rocket ship that has buttons that can launch to the moon; and, personally, a corpse-like Snow White that my 7-year-old promptly laid a smooch on, hoping he would be the charming prince to awaken her from her eternal slumber. We climbed deep into the mouth of Pinocchio’s Willie the Whale, surprised to find the tail end of a fish wedged deep into the whale’s craw. Even as an outdoor gallery of whimsical artistic delight, kid-free guests may enjoy a respite from the exhaustive attractions that make City Park so wonderfully dynamic and interactive. It is a lovely spot to simply rest weary feet, enjoy a snack and delight in the beautiful lushness that is the hallmark of New Orleans’ City Park. • Located on the southwest side of City Park. Entrance is on the north side of Victory Avenue. • Open 7 days a week, 10 a.m.-5 p.m.
• Adults $4. Free for kids under 3 feet tall. No pets. • You can host your birthday party or private event on Storyland’s grounds (learn more on the website).